Introduction The Solitaire stent retriever registry showed improved reperfusion, faster procedure times, and better outcome in acute stroke patients with large vessel occlusion treated with a balloon guide catheter (BGC) and Solitaire stent retriever compared with a conventional guide catheter. The goal of this study was to evaluate whether use of a BGC with the Trevo stent retriever improves outcomes compared with a conventional guide catheter. Methods The TRACK registry recruited 23 sites to submit demographic, clinical, and site adjudicated angiographic and outcome data on consecutive patients treated with the Trevo stent retriever. BGC use was at the discretion of the physician. Results 536 anterior circulation patients (of whom 279 (52.1%) had BGC placement) were included in this analysis. Baseline characteristics were notable for younger patients in the BGC group (65.4±15.3 vs 68.1±13.6, P=0.03) and lower rate of hypertension (72% vs 79%, P=0.06). Mean time from symptom onset to groin puncture was longer in the BGC group (357 vs 319 min, P=0.06).Thrombolysis in Cerebral Infarction 2b/3 scores were higher in the BGC cohort (84% vs 75.5%, P=0.01). There was no difference in reperfusion time, first pass effect, number of passes, or rescue therapy. Good clinical outcome at 3 months was superior in patients with BGC (57% vs 40%; P=0.0004) with a lower mortality rate (13% vs 23%, P=0.008). Multivariate analysis demonstrated that BGC use was an independent predictor of good clinical outcome (OR 2; 95% CI 1.3 to 3.1, P=0.001). Conclusions In acute stroke patients presenting with anterior circulation large vessel occlusion, use of a BGC with the Trevo stent retriever resulted in improved reperfusion, improved clinical outcome, and lower mortality. The recent positive randomized trials of acute ischemic stroke patients with large vessel occlusion heralds a new era in stroke therapy.1–8 A recurring theme in the design of these studies was emphasis on speed3 and efficiency of reperfusion to achieve optimal clinical outcomes. Stent retrievers were the dominant devices used in most of these trials, and concomitant use with a balloon guide catheter (BGC) was recommended in the Endovascular Treatment for Small Core and Proximal Occlusion Ischemic Stroke (ESCAPE) trial.3 The North American Solitaire acute stroke registry showed use of a BGC improves clinical outcome, and has faster reperfusion and procedure times in patients with large vessel occlusion stroke treated with the Solitaire stent retriever.9 However, routine use of the BGC with stent retriever embolectomy has not been widely adopted. The BGC is a supporting catheter placed in the neck. When the stent retriever device is retrieved with the clot, the balloon at the tip of the guide catheter is inflated to arrest antegrade flow from the carotid artery. Aspiration is performed concomitantly at the guide catheter tip to capture clot and reduce the possibility of distal embolization. The aim of the present study was to evaluate whether use of a BGC with the Trevo stent retriever similarly improves on reperfusion and clinical outcome in the Trevo acute ischemic stroke thrombectomy registry.10 We hypothesized that reperfusion would be superior with the BGC which may improve clinical outcome. The TRACK registry is an investigator initiated study that recruited 23 clinical sites to submit deidentified retrospective demographic, clinical presentation, site adjudicated angiographic, procedural, and clinical outcome data (modified Rankin Scale) on consecutive patients treated with the Trevo device from March 2013 to August 2015. The primary outcome of this study was to evaluate whether patients who underwent Trevo thrombectomy with a BGC had a good clinical outcome, defined by a modified Rankin Scale score of <2 at 90 days. Secondary outcomes included evaluation of mortality, angiographic reperfusion score, and use of rescue therapy between the two groups. BGC and intermediate aspiration catheter use were at the discretion of the treating physician. The time interval from symptom onset to groin puncture was recorded, as well as procedural time for patients who were reperfused. Patients were included if presenting within 8 hours from symptom onset of an anterior circulation large vessel occlusion or 12 hours of a posterior circulation large vessel occlusion. In this subset analysis of BGC, patients with posterior circulation large vessel occlusion were excluded for two anatomical reasons: (1) even with a balloon guide inflated in the vertebral artery, antegrade flow into the basilar artery may still be present by the contralateral vertebral artery, hence not representing true flow arrest ; and (2) the smaller caliber of the vertebral artery compared with the carotid artery may be a factor that may not permit temporary balloon occlusion. Thrombolysis in Cerebral Infarction (TICI) reperfusion scoring was defined by the Solitaire with the Intention for Thrombectomy (SWIFT) and Trevo versus Merci retrievers for thrombectomy reperfusion of large vessel occlusions in acute ischemic stroke (TREVO2) trials.11 12 Symptomatic intracranial hemorrhage was defined as any parenchymal hematoma, subarachnoid hemorrhage, or intraventricular hemorrhage with worsened National Institutes of Health Stroke Scale (NIHSS) score by >4 points within 24 hours. Rescue therapy was defined as any additional drug (ie, intra-arterial lytic) or device used other than a stent retriever. Each center adjudicated reperfusion scores, hemorrhage type, and clinical outcome, including modified Rankin Scale score and discharge NIHSS score. The data were initially stored at the Medical College of Wisconsin. In 2016, the data were transferred to the central coordinating site at Mercy Hospital. Institutional review board approval was obtained from each institution’s review board. Baseline demographic, clinical, and imaging characteristics were compared between patients with and without BGC placement using the Student’s t test for continuous variables and the Fisher exact test for categorical variables. Variables with a P value <0.10 were entered into a multivariate binary logistic regression model to determine predictors of good clinical outcome and successful reperfusion. Statistical analyses were performed using JMP V.13 (SAS Institute Inc, Cary, North Carolina, USA). There were 634 patients in the TRACK registry. After exclusion of 84 patients with posterior circulation large vessel occlusion, 6 patients with tandem occlusion, 3 patients who did not have the Trevo as the first device, 2 patients <18 years old, 1 patient with unknown clot location, 1 patient with unknown BGC status, and 1 patient with extracranial occlusion, there were 536 patients with anterior circulation large vessel occlusion included in this analysis, of whom 279 (52.1%) had BGC placement (figure 1). TRACK registry flowchart. BCG, balloon guide catheter. Baseline demographics were notable for younger patients in the BGC group (65.4±15.3 vs 68.1±13.6, P=0.03), lower rate of hypertension (71% vs 79%, P=0.06), and more patients with atrial fibrillation (46% vs 39%, P=0.09) (table 1). Admission NIHSS was slightly lower in the BGC group (16.7±6.0 vs 17.6±6.0, P=0.07). The site of arterial occlusion was similar between the BGC and non-BGC groups. More patients in the BGC group received intravenous tissue plasminogen activator (57.0% vs 50.2%, P=0.13). Mean time from symptom onset to groin puncture was slightly longer in the BGC group (357 min vs 319 min, P=0.06). Aspiration catheter use was more common in the non-BGC compared with the BGC group (42% vs 12%, P<0.01). TICI 2b/3 scores were higher in the BGC cohort (84% vs 75.5%, P=0.01), with no significant difference in TICI 3 scores (46 vs 41%, P=0.41), reperfusion time (56 vs 61.5 min, P=0.51), or use of rescue therapy (19% vs 23.7%, P=0.16) (table 2). There was no difference in the number of passes. First pass effect, defined as complete TICI 3 reperfusion in one pass, was not significantly higher in the BGC cohort (25% vs 20%, P=0.14) (table 2). 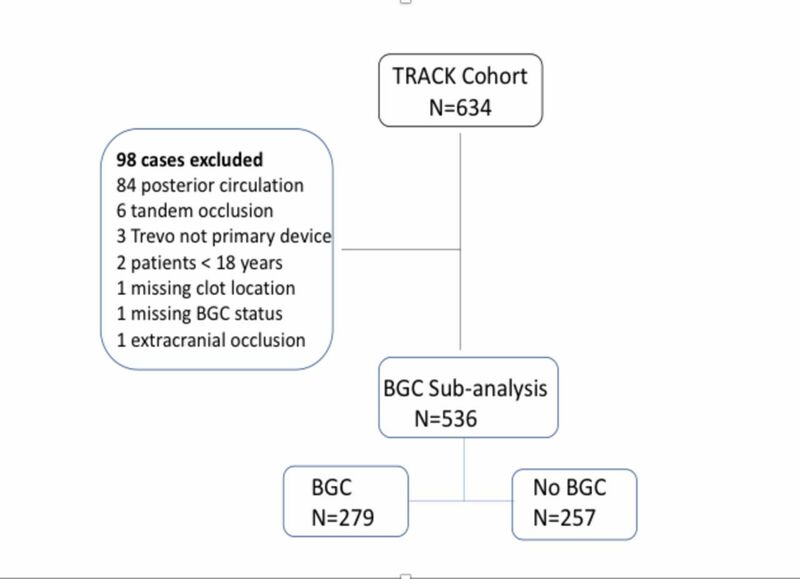 In the TRACK registry of acute stroke patients with large vessel occlusion treated with the Trevo stent retriever, we confirmed that the use of the BGC was associated with improved clinical outcome, lower mortality, and improved reperfusion compared with non- BGC patients. This analysis further reaffirms the clinical and reperfusion benefit of BGC use with stent retriever embolectomy in a large cohort of acute stroke patients. There are potential confounders to consider in these results. In patients with difficult aortic arch access, this is associated with a higher degree of complexity of access to the clot and potentially a lower chance for successful reperfusion with a large BGC. The proceduralist may have chosen to go with radial artery access which would not have permitted passage of a large 8 F BGC compared with conventional guide catheters. Further, younger age, lower baseline NIHSS, and greater use of intravenous tissue plasminogen activator in the TRACK BGC group may have favored better angiographic and clinical outcome. On the other hand, longer time from symptom onset to groin puncture (37 min median longer delay in the BGC group) would be expected to carry less favorable outcome in the BGC group. Every 30 min delay to reperfusion carries an OR of 0.79 (0.72–0.87)13 to 0.88 (0.8–0.98)14 lower likelihood of a favorable clinical outcome. Furthermore, greater use of intermediate aspiration catheters in the non-BGC cohort would be expected to have favorable results in the non-BGC cohort. After adjustment of these factors in the multivariate analysis, BGC use resulted in better clinical outcome and reperfusion compared with non-BGC use. The achievement of complete reperfusion from a stent retriever on its first pass is becoming an important metric for new devices in acute stroke endovascular therapy. The first pass effect is defined as complete reperfusion with a single thrombectomy device pass.20 In the NASA study, the first pass effect was more frequently associated with use of a BGC and was an independent predictor of good clinical outcome.9 A meta-analysis of BGC studies including 2022 patients demonstrated that the BGC group demonstrated higher odds of first pass reperfusion (OR 2.1, 95% CI 1.65–2.55).18 In this TRACK BGC subanalysis, the first pass effect was not significantly different between the BGC and non-BGC groups. As patients presenting with single thrombus are more common than those who present with multiple thrombi in large vessel occlusion cohorts,25 a TICI 2a or TICI 2b score after stent retrieval is likely the result of thrombus fragmentation from device retrieval rather than the uncovering of a second pre-existing thrombus. Utilizing the technique that achieves the highest clot retrieval score possible is therefore important to minimize the risk of downstream clot fragmentation. Our study reinforces the benefit of BGC in achieving higher reperfusion scores, which in turn was the driver of better clinical outcome in patients with large vessel occlusion stroke. Our study had limitations. There was no independent or blinded adjudication of the clinical outcome and imaging results of each patient. Rather, this adjudication was performed by each site, which may bias towards better angiographic and modified Rankin Scale score results. Knowledge of the prior NASA study results may bias investigators to report higher reperfusion rates in patients who were treated with a BGC. Aspiration at the microcatheter with concomitant stent retriever pull back (Solumbra) is another technique that has been advocated to reduce distal embolization.26 We did not investigate the effect of this technique systematically in this registry. In acute stroke patients with anterior circulation large vessel occlusion, use of a BGC with the Trevo stent retriever device resulted in improved clinical outcome and improved reperfusion. Further evaluation of these findings may be important, along with the role of aspiration, preferably in the context of a randomized clinical trial.
. SWIFT PRIME Investigators. Stent-retriever thrombectomy after intravenous t-PA vs. t-PA alone in stroke. N Engl J Med2015;372:2285–95. Contributors OOZ and ACC initiated and led the TRACK registry, and performed the data analysis. TNN drafted the manuscript and its revisions. All authors contributed data and revised the manuscript. Funding Stryker Neurovascular; limited coordinating center administrative grant. Subanalysis supported by a SVIN pilot grant. Competing interests TNN is a consultant for Medtronic. OOZ is a consultant/advisory board member for Stryker Neurovascular and Covidien. OOZ is overall principal investigator for TRACK–no compensation and Arise II–modest. RGN is a consultant/advisory board member for Stryker Neurovascular and Covidien. Stryker Neurovascular (Trevo-2 trial principal investigator–modest; DAWN trial principal investigator–no compensation, TREVO registry steering committee–no compensation), Medtronic (SWIFT trial steering committee–modest; SWIFT-Prime trial steering committee–no compensation; STAR Trial Angiographic Core Lab–significant), Penumbra (3D Separator trial executive committee–no compensation), Neuravi (ARISE-2 steering committee–no compensation), Genentech (physician advisory board–modest), Allm Inc (physician advisory board–no compensation), editor- in-chief Interventional Neurology journal (no compensation). SRS is a consultant for Stryker Neurovascular. JDE is a consultant for Stryker Neurovascular. IL is a consultant for Medtronic, Stryker, Penumbra, and Cordis. Data sharing statement The data are only available to the coordinating investigators in the study.